Note: We are giving away our full product range as prizes in a Valentines Lucky Draw. Enter to win! Enter to win there will be a number of winners in each category. The route to entry for the competition: Competition entries may be submitted by persons invited by a promoter or by an entrant by way of an invitation or shared invitation on social media (see 5 below). The social media platform for this competition is one of the social media platforms listed in 5. above. Closing date for entries will be 12 February 2018. After this date, the no further entries to this Lucky Draw will be permitted. The promoters reserve the right to cancel or amend the competition and these terms and conditions without notice. Participants are picked at random and will be notified by e-mail . A number of prizes in each category will be awarded. Entrants must be resident in KZN, South Africa. Winners are required to comment on the product that they won on www.app.naturexankzn.co.za. Mangosteen fruit scientifically known as Garcinia mangostana grows on a tropical evergreen tree, believed to have been originated in Indonesia and is widely available in several South East Asian regions like Singapore, Malaysia, Thailand, and Vietnam and also in some regions of Africa. The purple Mangosteen, also known as ‘Mangustan‘ in Hindi, ‘Ivarumamidi‘ in Telugu, ‘Kaattampi‘ in Malayalam, ‘Kao‘ in Bengali, ‘Murugala Hannu‘ in Kannada, ‘Kokum‘ in Gujarati, ‘Kokam‘ or ‘Ratamba’ in Marathi, is acclaimed for its unique appearance and flavor is often revered as queen of the tropical fruits, especially in the orient. Mangosteens are rich in vitamin C and contains about 12% RDA per 100g. Being a powerful water soluble anti oxidant, vitamin C provides resistance against flu like infectious agents and scavenge harmful pro-inflammatory free radicals. Therefore consumption of fruits rich in vitamin C is vital for developing resistance against diseases. Folate plays an important role in foetal development and evolution of new cells in the body. This particular vitamin is vital during pregnancy and protects neutral tube effects. By increasing the amount of blood flow to the eye, Vitamin C in mangosteen is effective against cataracts.1000mg Vitamin C per day is said to be effective in curbing cataracts and improving vision. 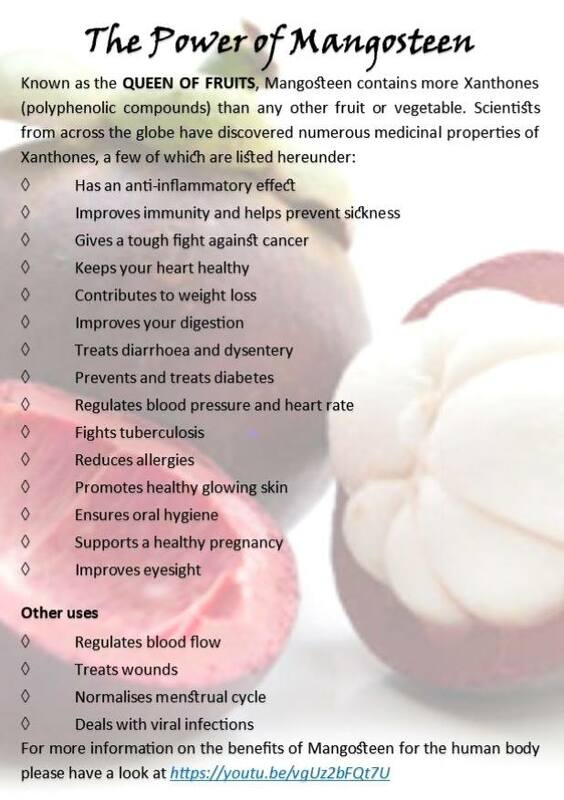 Xanthones present in mangosteen have the natural ability to attack fungal and viral infections. They can even help to get rid of certain carcinogens from attacking your skin.